Five o’clock rolled around and people started to head inside. 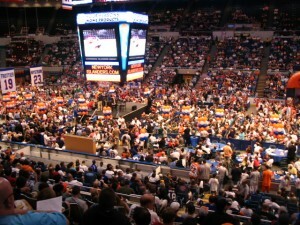 Islanders were giving tours of the locker rooms, selling equipments, and had many games and tables set up. Mike Bossy, Bryan Trottier, and Bobby Nystrom were at the party making their way around signing autographs for anyone who asked. Around 6:30 p.m. was when many people started getting nervous. Word was getting around that Colorado said the Islanders were definitely taking Matt Duchene. People started thinking about every little comment that someone would make. All the fans seemed paranoid. The draft was getting closer and the mixed amounts of emotion were colliding in one giant blender. Everywhere you looked you could see people wearing Tavares shirts they made themselves and some even as far to be seen wearing Tavares Islanders jerseys. People made plenty of signs showing their interest for John Tavares. Finally the time came and the Islanders made their pick. I had my camera ready to record history. This was the most emotion seen from the fanbase since Shawn Bates’ penalty shot in 2002. Judge for yourself.